The unsuccessful launch of ‘Proton-M’ on July 2 has meant that restructuring of the Russian space sector has had to be brought forward. How deep is the systemic crisis in Russian astronautics and what can be done to overcome it? “It seems something is wrong” uttered the presenter from the Russian Federal News Channel as he watched the launch vehicle ‘Proton-M’ fall flat and head back to Earth on live television. Eye-catching footage of the catastrophe drew the attention of the leadership and of the public to the Russian space sector and forced them to find an answer to the question of what it is exactly that is ‘going wrong’. Although this is already well known to specialists and analysts: “A systemic crisis” is the phrase that the majority of them utter when the conversation turns towards the state of the Russian space industry. Here however a few of the key points need to be highlighted. The crisis in the space sector is first and foremost one of personnel. Formally there is no personnel issue: Officially 244,000 people are currently employed in the Russian space industry enterprises, more than anywhere else in the world. However there are very few among them who are of middle age, and at their most productive. Secondly the consequence of such a large workforce is extraordinarily low labour efficiency. This in turn is the key reason why wages remain low. As a consequence the low wages naturally mean that the best personnel are leaving the sector. It is impossible to solve the personnel issue without consolidation of the space sector and serious cutbacks in both the number of enterprises and their employees. This is evident to the leadership of Roscosmos, who defend the idea of creating a state corporation on the basis of the agency, similar to Rosatom, and transferring state assets under its management. Such a step would allow improvements in the manageability of the sector and as a result increase both labour efficiency and the quality of the finished product. However standing in the way of reform is resistance on the part of the enterprises who do not want to lose their independence. For them the current situation is very comfortable - surviving on state orders they are, in essence, existing in an environment free from competition, and the issues of labour efficiency and production quality are secondary. The responsibility for failure lies first and foremost with Roscosmos. The current head of Roscosmos Vladimir Popovkin faces a whole series of bold and unavoidable decisions, which his predecessors would not have had the courage to face. Soon after his appointment he began a campaign to identify misappropriation of funds and a series of resignations at various enterprises followed unscheduled checks. In April of this year President Putin supported an initiative started by the Head of Roscosmos proposing that the government examine the issue of setting up a space ministry. This was how the space sector was organised in the USSR - the enterprises were subordinate to the ministry of general manufacturing. 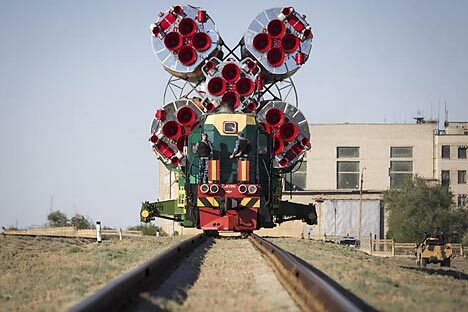 All in all, the ‘Proton-M’ catastrophe in July, which was caused by manufacturing negligence, exacerbated by a design flaw in the rocket, has galvanised the leadership of the country to restructure the sector. There are rumours deep within the space administration that the decision has already been made and will be announced soon. Restructuring of the sector will inevitably be accompanied by a review of the Federal space programme. Evidently the trend set by Roscosmos to lend greater pragmatism to the programme will continue. A reduction in the share of the budget on manned astronautics, which has next to no economic effect, will be accompanied by an expansion in spending on launching satellites, which are vital to the Russian economy. Apart from that, expansion in participation in international space programmes will become an important part of the strategy of Roscosmos. Military and research astronautics though will not be forgotten. In the end, in the last few years work to build the Russian Vostochniy Cosmodrome and create the new ‘Angara’ launch vehicles, which are to replace the ‘Proton-M’ has gathered pace considerably. All these measures give us hope that Russian space industry can survive this current difficult period, and that Russia will retain her position among the leading nations in the space industry.